Recently thought to include two genera, the family Trachyphylliidae is represented by two forms in the genus Trachyphyllia that aquarists will recognize. Formerly described as separate genera, Trachyphyllia geoffroyi and Wellsophyllia radiata have become synonymous and are commonly known as "Open Brain" corals. Some popular literature does distinguish between the two forms as representing separate species within the genus Trachyphyllia. The authors make little distinction between the animals for the purpose of this report. T. geoffroyi predominantly represents this genus in captivity. "T. radiata" forms appear less commonly in imports. While similar in gross appearance, these two forms may have differences in their origins on the reef and subsequent captive requirements that lend to the morphological distinctions, even if not to speciation. The exact taxonomic classification of the animal is of little matter to most aquarists and is admittedly beyond the scope of the authors. This report describes the husbandry and fascinating asexual reproductive strategy of Trachyphyllia through decalcification to produce daughter colonies. 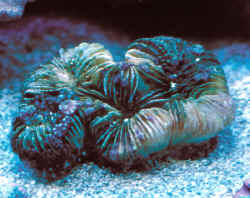 We begin first with a bit of history and general information on Trachyphyllia for improved care in reef aquariology. T. geoffroyi is a free-living animal at maturity and can be found in lagoons and protected margins of the reef buried in sand or muddy substrates. They should always be maintained as such in display. The conical skeleton of this species has evolved to serve this very orientation specifically. Placement of these animals upon rocky substrates can sometimes lead to abraded tissue from daily polyp cycles (expansion and contraction) or displacement when an inflated animal becomes imbalanced. Damage to the tissue of Trachyphylliids is not especially quick to heal and is often hampered by infection or predation. Fish, shrimp, crabs and worms are often attracted to injured Trachyphyllia to graze upon infected tissue or prey on the vulnerable animal altogether. Trachyphyllia commonly occur in moderately deep and clear waters and do not seem to be as well adapted at removing sediment as other free-living corals on soft substrates like the Fungiids, for example. This can be a problem in aquaria with inadequate water flow or active tank-mates such as sand-sifting gobies that deposit sediment upon Trachyphyllia. Moderate water flow is recommended to remove lingering sediments, although caution should be exercised to avoid too much that will compromise their mucous net feeding strategy. Ultimately, Trachyphyllia are exceptionally adaptable to a wide range of water flow if sedimentation is not a concern. With the exception of intense metal halide lighting over shallow aquaria, Trachyphyllia species have proven to be quite adaptive to a wide range of aquarium lighting. Artificial illumination favoring the blue end of the spectrum is recommended for deeper water specimens. T. geoffroyi occurs in a range of color from red through brown to green. Red and brown specimens come from deeper waters and seem to require less light, while brightly reflective green individuals are the most tolerant of bright light, hailing from UV rich, clear, less deep waters. Pale-colored specimens, such as pink or yellow, are not healthy animals but merely stressed corals that have "bleached" (specifically, they have aborted a significant amount of Zooxanthellae). In time, if the animal survives the event of stress, proper pigmentation may return. Without supplemental feeding, however, most bleached animals die from attrition. Trachyphyllia are active feeders and are able to accept larger zooplankton than most corals. Their large feeding tentacles come out at night as most corals do that favor zooplankton. Feeding at other times of day may be possible by the introduction of a stimulant such as the thawed "juice" from frozen ocean meats (shrimp and krill work well, fifteen minutes prior to feeding). Finely shredded meats or whole prey of marine origin like pacifica plankton and Mysid shrimp are very good fare. Avoid feeding zooplankton substitutes larger than ?" in size. Inappropriately large food items may be accepted by the animal but are usually regurgitated later in the form of floating mucosal rafts. In time, the animal may starve under the care of an aquarist that thought such large chunks of food were being digested. Trachyphyllias have been observed, like other free-living corals such as Fungiids, to feed with a mucosal "net" and they are known to swell to an impressive size as part of the feeding strategy. Some aquarists have noticed Trachyphyllia specimens also shrinking over time and taking on a "skin and bones" appearance. Inadequate feeding has been implicated in this phenomenon. Trachyphyllia species are not autotrophic animals to say the least. They cannot survive on the products of symbiosis alone! At minimum, open brain corals should be fed several times per week. More food may be necessary for growth. With significantly less representation in captivity than T. geoffroyi, husbandry for the "T. radiata" form is not as clearly defined although it is sure to be similar if not the same (with consideration for their synonymy). Unlike T. geoffroyi, "T. radiata" forms are not considered to be only free-living animals. It is said to be common in deeper water than T. geoffroyi and attached to hard substrates. One interesting theory about the heavily iridescent, bright green coloration of "T. radiata" (AKA "metal dome" open brain coral) is that such pigmentation may be used to refract and amplify the weakly available light in said deep water. Contrary to the common belief that many coral proteins serve predominantly to reflect UV intense light away, some proteins are instead found below the Zooxanthellae and serve to reflect light back to the symbiotic algae (Borneman, pers. comm.). This is consistent with anecdotal observations by many aquarists that the "metal dome" or "metallic" open brain coral favors weaker illumination (especially on import). Yet other aquarists have also reported the form to be quite hardy and tolerant of bright light with proper acclimation. Beyond the obvious explanation that such contrasts can be described by the collection of specimens over a wide range on the reef, Trachyphyllia species have long since demonstrated great hardiness and adaptability in captivity, including remarkable photoadaptation. Placement of the hemispherical "T. radiata" type animal upon a hard substrate or reef proper may be equally acceptable with due consideration for acclimation to new, captive lighting. "T. radiata" forms are easily distinguished from T. geoffroyi in most cases. The corallum of T. geoffroyi is generally cone-shaped (flabello-meandroid) while that of T. radiata is flat-bottomed (hemispherical). "T. radiata" is also likely to be more convoluted in form while T. geoffroyi might be described as simple, fused lobes. This report specifically addresses a fascinating observation by the authors of numerous asexually produced daughter colonies of Trachyphyllia in an aquarium specimen not unlike anthocauli in Fungiids. In popular literature, anthocauli production has been reported in the family Fungiidae (Borneman, 2001; Calfo, 2001; Delbeek & Sprung, 1994, Veron 1986). Other forms of asexual reproduction have been reported in Trachyphyllia in captivity. Small polyp buds, for example, have been observed to form in growth around the base of parent colonies in similar fashion to the budding commonly observed in Caryophylliids (including so-called Bubble, Hammer, Octopus, Torch, and Frogspawn corals). However, the distinct formation of daughter colonies through de-calcification of a parent colony has been scarcely reported non-Fungiids. The occurrence seems to be uncommon if only for the fact that aquarists are unlikely to leave the denuded "skeleton" (corallum) of the parent colony in plain view for months with the hope of it rising from the dead, so to speak. In the production of anthocauli in Fungiids, a seemingly dead, denuded parent may appear to spring back to life from the remnant "skeleton" after several to many months of dormancy. Daughter colonies are formed by the decalcifying parent as they bud and grow along the septa. 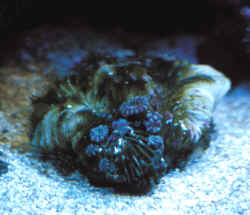 Anthocauli can form on either side of a Fungiid, but it remains to be seen if clones in like kind can be produced on the corallum of Trachyphyllia. The illustrated Trachyphyllia was in a client's 150-gallon reef aquarium for over three years. On Jan. 16th, 2002, it was discovered that at some point in time since the last service call, the Trachyphyllia had been overturned on the sand floor. The most likely cause was a large Coris wrasse. Unfortunately for the coral, no one in residence noticed or cared enough to do anything about the coral's distress. When it was discovered, the coral was righted and an attempt was made to gently vacuum off the necrotic tissue with a slow siphon from ?" tubing. Alas, the coral was denuded of apparent tissue, leaving behind only the seemingly dead, white corallum. Service on the aquarium was completed and the "skeleton" was left in the tank. The bare, exposed "skeleton" quickly became prime real estate for nuisance algae, Valonia and Derbesia, probably fueled in large part by the lingering nutrients from the decomposed parent tissue. There was little concern for plague algae at this time, as faith in aggressive protein skimming and water changes would take care of them in short order. On February 23rd, 2002, during another service call, some flashes of iridescent green were apparent between the algae on the denuded Trachyphyllia corallum. The first thought was that a green Zooantharian, Protopalythoa, in the display had spread. Upon further investigation, it was observed for the first time that daughter colonies appeared to be springing forth from the septa of the remnant corallum. The event seemed to be very similar to anthocauli production in the Fungiids. Without having heard of this reproductive strategy reported before in captive Trachyphyllia, a call to co-author and friend, Anthony Calfo, led us in discussion to believe that there was indeed merit in offering a report of this scarcely described reproductive strategy to the body of popular literature on reef aquariology. The corallum was removed to a better display for dedicated care and photography. The first picture is from February 24th detailing the small daughter colonies emerging, as well as the nuisance algae. The next picture is from March 8th and demonstrates that the colonies have grown significantly larger and the alga has all but disappeared. There are, as of April 18th, a total of 37 baby Trachyphyllia, eleven of which have become apparent since April 1st. What is most promising about this observation is that the families Fungiidae and Trachyphylliidae are distant in Veron's family tree of Scleractinia (Veron, 1986). If both of these coral families are capable of producing anthocauli, then perhaps there are more species in the trade that share this strategy of asexual reproduction. Some aquarists may be very pleasantly surprised and rewarded for leaving a seemingly dead and denuded Scleractinian "skeleton" in an otherwise healthy display with hope for the continuation of life. Clarification on the Root and Use of the Word "Anthocauli"
Borneman, Eric H. 2001. Aquarium Corals: Selection, Husbandry, and Natural History. T.F.H. Publications. Borneman, Eric H. 2002. Personal communication. Veron, J. E. N. 1986. Corals of Australia and the Indo-Pacific. University of Hawaii Press.